After a bad season with poor performances, injuries and almost 365 days without scoring a field goal Eden has found his joy again playing football. While Eden’s career has been a rising star for years, season 2015-16 is one to forget. After guiding Chelsea to the League Title and being awarded Player Of The Year 2014/15 trophy, everything went downhill from there. Chelsea started the new season with several defeats and was even heading towards relegation. A sudden collapse of form of key players could not be explained. Fabregas, Costa, Oscar, Hazard and even the recently hired Pedro lost all of their footballing skills. From hero to zero. The only one not loosing his form was Willian. For media and fans it was all but clear: the Chelsea team was tired of Mourinho and wanted him to leave. They worked hard to win the league trophy and then the magic broke between players and coach. Some Chelsea fans called these players “RATS”, for getting Chelsea’s success coach Mourinho fired. Shortly after Hiddinck took over players like Costa, Fabregas and Oscar started to be able to play much better. Hazard however continued to struggle. And then got injured. Enough reason for some fans to make a Youtube about Eden’s performance. Where they wrong? Chelsea recovered under Hiddinck, but had lost inspiration and the winning spirit to win games. It was accumulating draws with no sight of champions league football next season, nor Europa league. A drama for a team that was ready for the semi-finals of the Champions League. 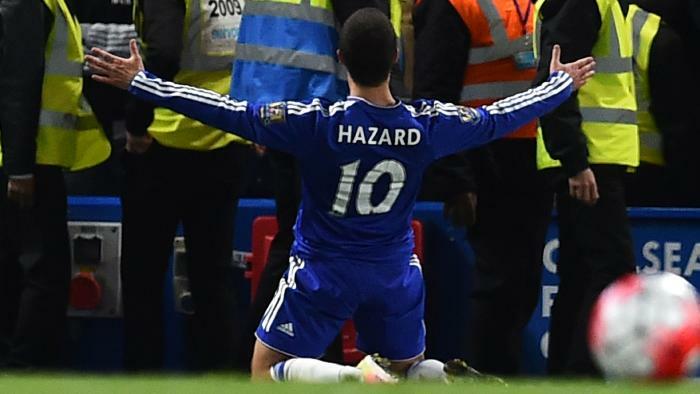 But Hazard has played 2 very good games and scoring against Tottenham and Liverpool. The goal against Liverpool is an example of Hazard’s class: See both goals below. Hazard has regained his form just in time for the start of the Euro Cup 2016.